March 2019 -- Dr. Feinblatt featured in Oregon Live article regarding Jusuf Nurkic's leg injury - When might he return? 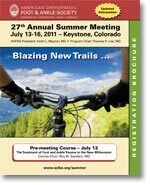 Abstract: The literature on treatment of advanced arthritic changes in the lesser metatarsophalangeal joints is sparse. Options include fusion, resection or interpositional arthroplasty, biological resurfacing, as well as silastic or metallic joint replacement. Little data surround the use of a metallic hemiarthroplasty of the lesser metatarsal heads, and clinical outcomes data for the mid-term to long-term results is currently nonexistent. Suffering with pain or stiffness in your feet and ankles? It could be arthritis. More than 52 million Americans have the condition, which destroys the normal workings of a joint. Arthritis most commonly affects the knees, hands, hips and spine, all of which impact quality of life in some way. But when arthritis affects the feet and ankles, mobility can be severely limited. “It’s important to understand what type of arthritis you have so you can receive the right treatment,” says Jeffrey Feinblatt, MD, an orthopaedic foot and ankle specialist in Tualatin, Ore. “Osteoarthritis that comes with age is treated differently than rheumatoid arthritis, which is an autoimmune condition.” There’s also a form of arthritis that affects the big toe. Now available at Springer publishing. 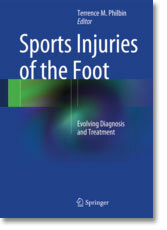 Sports Injuries of the Foot is the go-to text for the management and treatment of foot injuries in athletes, demonstrating the current state-of-the-art techniques in assessment, testing and treatment. 4/25/2013 Orthopedic Surgeon Dr. Jeff Feinblatt was this morning's Providence expert on KXL In Depth, speaking of women and joint health, and promoting the upcoming Women Wellness forums on joint pain. Please click the link below to listen to Dr. Feinblatt’s interview – which discusses why women are more susceptible to joint problems and what women can do to keep their joints healthy as they age. Although much has been written on the evaluation and management of pelvic ring injuries, only a single case of anterior sacroiliac joint dislocation exists in the literature and was reported in 1976. 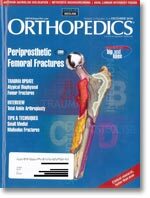 This article describes 2 additional cases, 1 of a pure anterior sacroiliac dislocation in a 25-year-old man, and 1 of an anterior sacroiliac fracture-dislocation in an 18-year-old man, each treated by a different orthopedic traumatologist at neighboring trauma centers. Both cases were the result of high-energy trauma, and both patients had significant complications resulting from severity of their injuries, including wound dehiscence and causalgia in 1 case and persistent L5-S1 paresthesias and paresis in the other. Closed reduction can be attempted, but in our experience was unsuccessful even with the use of external fixation pins for leverage. We recommend open reduction by an orthopedic traumatologist who will perform definitive fixation. The decision to use an anterior external fixation frame to assist during the patient's resuscitation should be based on the patient's hemodynamic status and concomitant injuries. Despite a high complication rate, operative intervention can return patients to a functional level with minimal residual pain. The goal of this study was to determine whether a difference in cycles to failure or mode of failure would be observed among specimens of 3 high-strength suture materials, and whether different suture configurations would affect knot security. 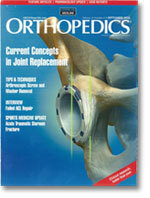 Ten representative specimens of Ethibond (Ethicon, Inc, Somerville, New Jersey), FiberWire (Arthrex, Inc, Naples, Florida), MaxBraid (Biomet, Inc, Warsaw, Indiana), and Orthocord DePuy Orthopaedics, Warsaw, Indiana) were tied in 6 different knot configurations commonly used in orthopedic procedures. Each specimen was cyclically loaded be-tween 9 and 180 N at a rate of 1 Hz until the specimen failed or reached a maximum of 3500 cycles. Each suture material was subjected to tensile loading until failure at a rate of 1.25 mm/s. The 3 most secure knots all included the 3 reverse haIr-hitch on alternating posts (3-RHAP) configuration. All specimens tied with these 3 knot types failed by suture rupture. All knots using the overhand with 3 of the same half-hitches on the same post (O-3SHSP) configuration failed by knot slippage regardless of suture material. When the 3 strongest knots were combined, FiberWire resisted a significantly greater number of fatigue cycles than Orthocord or MaxBraid. In the single load to failure tests, Orthocord, FiberWire, and MaxBraid all had significantly higher ultimate strength than Ethibond. Knots using the 3-RHAP configuration provide security superior to that of those with-out this configuration. All 3 high-strength sutures tested outperformed Elhibond in single load to failure testing, with FiberWirc resisting the greatest number of cycles. Postoperative strength and reliability of a soft tissue repair is inherently dependent on the properties of the suture materials used.